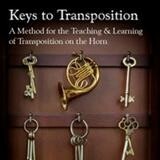 Horn players need to transpose, yet until now, there has not been a complete method devoted to teaching this essential skill. This method begins by explaining why horn parts need to be transposed and then uses this historical information to provide the hornist with a concrete strategy to master transposition. After building skills through exercises, excerpts from the horn literature are presented for practical application. Helpful transposition tips, practice techniques, and musical advice enhance the musical examples.